When it comes to school spending, many people would agree that there is a need to increase funding for teachers, programs, and activities that have a direct influence on students. But how to achieve that is the difficult part. To get an idea of exactly what Prince George’s County Public Schools spends and where, it is worth comparing how our school system allocates its funding versus other area school systems. Not that other systems are inherently better at how they spend money, but it is a way to benchmark and to look for ideas and opportunities. PGCPS is the 21st largest school system in the nation (2014 data from the National Center for Education Statistics). It’s the second largest school system in Maryland and the third largest in the D.C.–Maryland–Virginia region. Montgomery County Public Schools is the largest school system Maryland and the 17th largest in the nation. Fairfax County Public Schools is the largest in the region and the 11th largest in the nation. 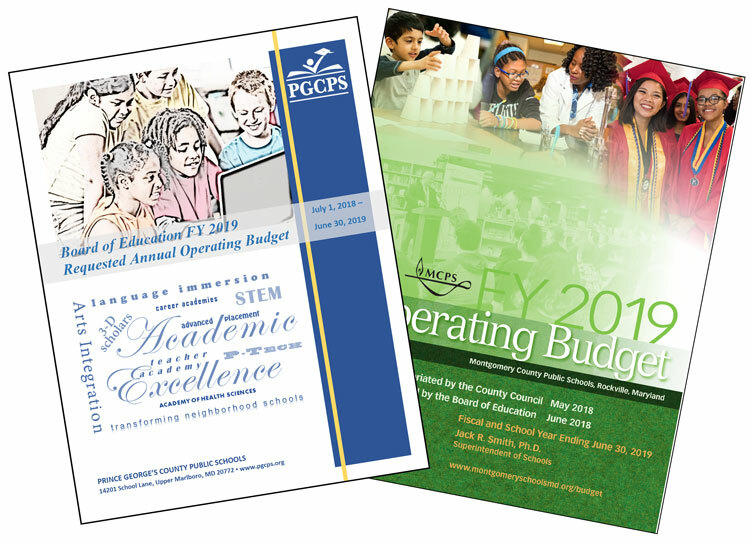 Because the Maryland State Department of Education requires county school systems to organize their operating budgets into standardized categories, it is relatively simple to compare how MCPS and PGCPS allocate their funds. (Adding FCPS to the comparison is more difficult because its budget does not detail spending in the same manner.) This comparison does not include the separate capital improvement budget each school system compiles annually.